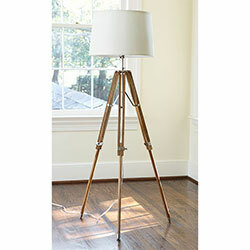 I’ve noticed a few tripod lamps around lately of varying degrees of attractiveness. Not sure what I think. Anyway, you can DIY. Although you’d want to spend minimum $ on a tripod or use one that is bung but still upright. Also I thought this solar heating thing would appeal to my Dad – who now has 15,000 Litres of water in an inflatable bladder (Yes, that is what I said) under his deck and has just installed an evaporative cooler. Fortunately for my mum and sisters, we don’t have copper pennies in Australia, if we did, they would never forgive me – their days of crowding in front of the gas wall heater could be over.